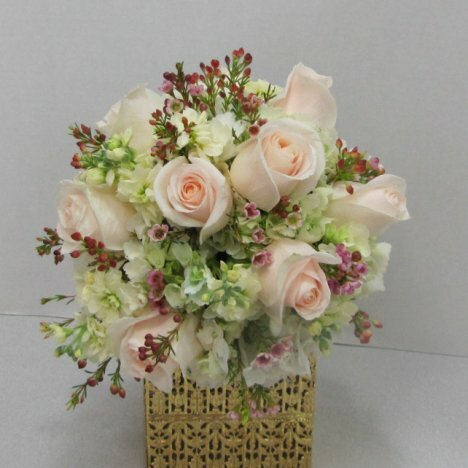 This hydrangea bridal bouquet is going to not only be beautiful, but it will have a fragrant scent that you will love. The next flower I add to the design is called stock flower. It comes in both standard (single heavily flowered stem) and spray (smaller stems spraying off from main stalk). Stock has a delightful scent. 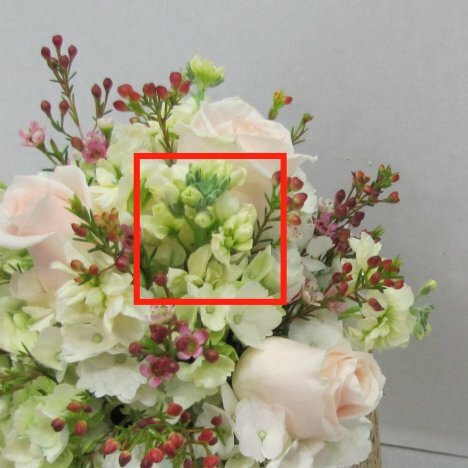 It is a hardy flower that resembles hydrangeas to a certain extent. I know that this flower is very dependable and can work well in keeping to the all over design if my hydrangeas should not hold up for any reason. Cream stock does have a decided greenish cast, however, so you should go with white if you do not desire this color. This particular bride wanted soft pastels in her flowers and the lovely green hues added a beautiful element to the overall color scheme. Stock has tighter closed florets than hydrangea. 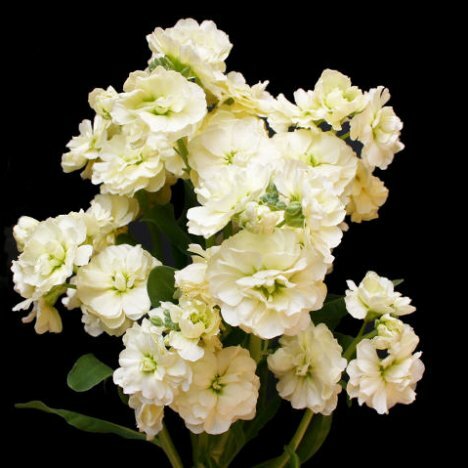 I specifically added it for the beautiful scent that it added to the bouquet. 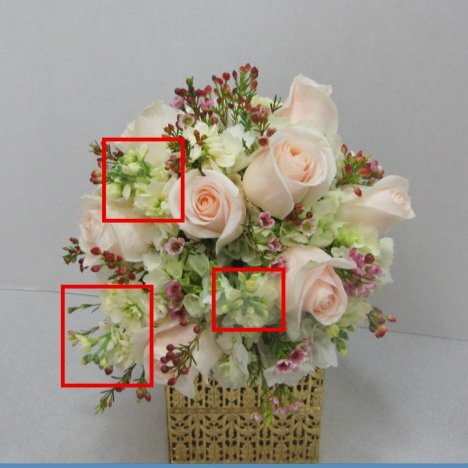 Remember to please all the senses in flower design, including smell as well as a mix of beautiful shapes and textures. I marked in red where I scattered and added cut stems of stock. Fill in any open holes in the overall design, making sure to cover open places where the green foam shows. 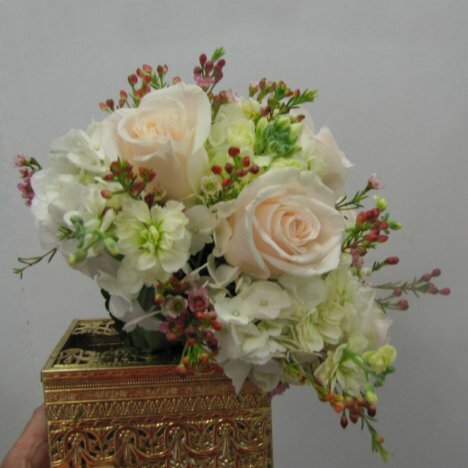 This bouquet actually comes together quickly, since the hydrangeas create a full backdrop for the other flowers. 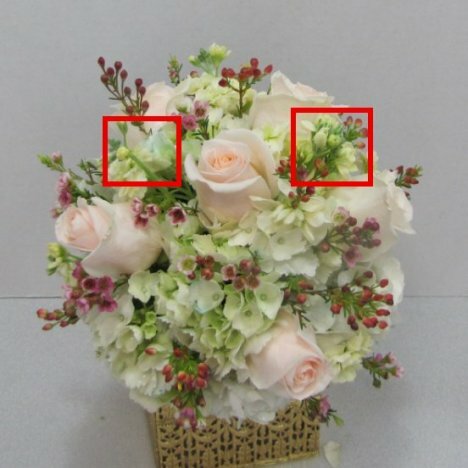 From the side view, you can see how it adds more interest if you stagger the height of the different flowers. Create different lengths for a more casual, garden style look. 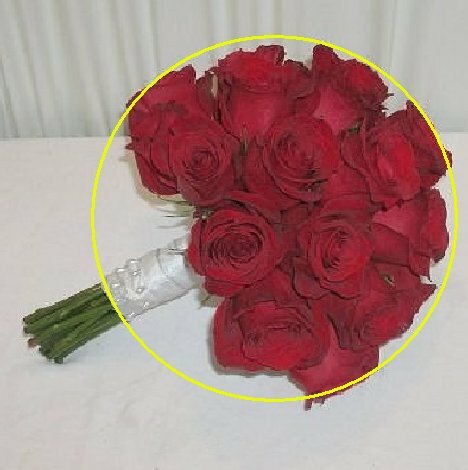 If you desire the smooth rounded finish of a domed design, it lends itself better to a bouquet with all the same size and variety of flower heads, such as roses. 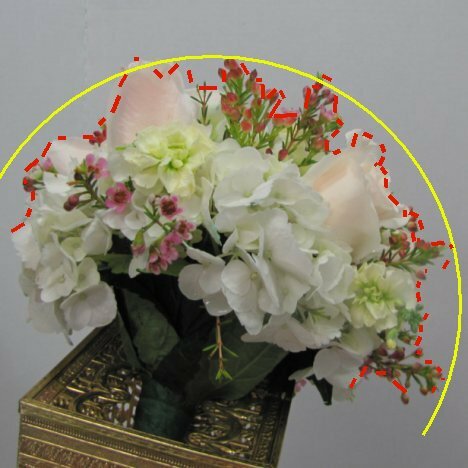 As shown below, all of the flower heads are fitted together and cut as the same length, to give a perfect, rounded shape instead of the more casual staggered look above.